There are several challenges to blogging. One of the biggest is wrangling and organizing ideas. In the beginning you have lots to write about, but one day you’ll wake up and wonder, “What should I blog about today?” One of the easiest ways to avoid this is through an editorial calendar. Here’s how to create one quickly and easily. 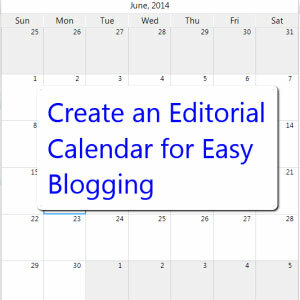 Before you can create your editorial calendar, you need to figure out what system will work best for you. Twelve month calendars come in difference sizes. Some you can hang on a wall. Others are like books. You can use a print or digital planner. Or you can use online tools, such as Google Docs or Evernote. If you use WordPress, you can use a plugin like Ideas to store blog post ideas and Editorial Calendar to schedule your posts. I’m taking a serious look at CoSchedule, which isn’t free, but along with organizing an editorial calendar, it also allows you to create your social media post related to the blog article at the same time. Start by writing down the main theme of your site. For example, Work-At-Home Success is about working at home. List the categories and tags you have so far. In my case, I’d list telecommuting, home business, online income etc. List categories and tags you haven’t used yet, but plan to cover. Do keyword searches on your categories and tags to find additional themes and topics. Look at the calendar for holidays and other events. For example, if you own a lingerie blog, it would be helpful to know that August 8 is National Underwear day. Some fun places to check out for writing ideas include BrownieLocks and Teacher’s Corner (scroll down to see the months). Read 14 Ways to Generate Blog Ideas for more ideas. How often will you post? Everyday? Three days a week? Which days will you post? Consider themed days or regular post types. For example, if you have a business blog, you can have “Marketing Mondays” in which you write about marketing on Mondays. Here at Digital Writer Success, I post about blogging on Mondays and writing/publishing on Wednesdays. Tuesdays and Thursdays I post writing jobs. Over at Work At Home Success, I post twice a day, jobs and an article, Monday through Thursday, and the newsletter (with more jobs) and podcast on Fridays. It’s difficult to make an editorial calendar too far in advance, unless you decide to have monthly themes, like magazines do. Starting out, sometimes it’s easier to plan two to four weeks ahead. This gives you the chance to see how well your calendar is working and what you can tweak to make it better. Depending on your blog topic, much of your content will likely be evergreen, meaning it will be relevant for a long time. But sometimes, things happen in your personal life or in the news that would be a great tie-in to your blog. Don’t be afraid to reschedule an evergreen post with something current. For example, my computer crashed a couple weeks ago, so I wrote a piece about how to prepare for tech disaster when working at home for Work-At-Home Success. Basically, your calender is designed to help not hinder or restrict you. It’s flexible and can change.